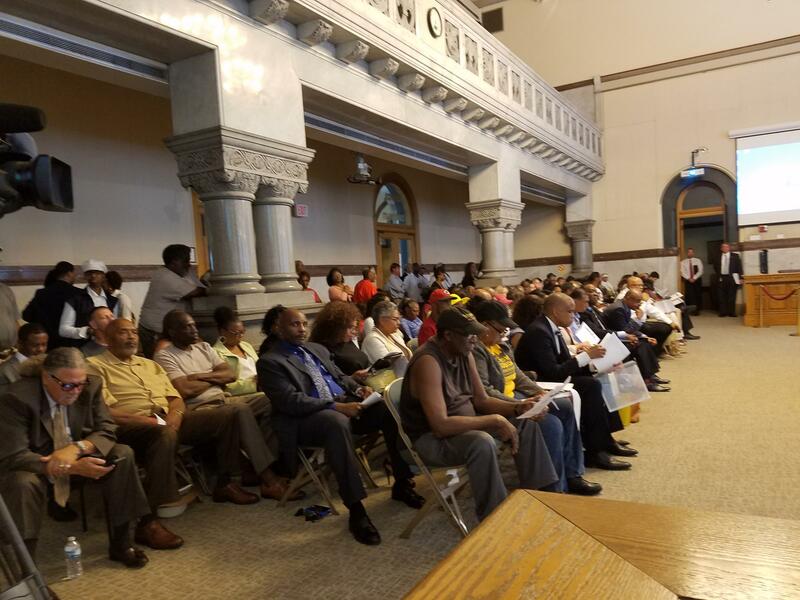 Members of Black Agenda Cincinnati fill council chambers Sept. 12, 2016. The motion stems from the work of Black Agenda Cincinnati, members of which spoke on the issue during a council committee Monday. Bishop Bobby Hilton says, "Now is the time for City Council to adopt a public policy to eliminate institutional racism within city government and a mechanism to hold itself accountable. This way, every policy and practice is reviewed, measured and documented to determine whether those polices and practices disadvantage black people on the basis of race." At least seven council members support the motion going before the full council, including Yvette Simpson. "I want us to pass this quickly so that we can be the first city," she says. "My understanding is that St. Paul is lining up as is Seattle." Vice Mayor David Mann says it's time to find issues and make changes. "Slavery ended 150 years ago, how long before the remnants of it are gone?," he asks. Council Member Chris Seelbach also supports the motion but offers some caution. "If there aren't specific policy objectives that are presented, money that's allocated different ways, then I think there's going to be a lot of false hope. So, I just hope that this motion and these intentions actually lead to specific action that will allow us to go to a path forward where we actually take on institutional racism." The motion does not lay out a funding plan. It now goes to the Mayor's office to be put on a full city council meeting agenda. Former Cincinnati Mayor Dwight Tillery, currently president of the Center for Closing the Health Gap, is organizing the Black Agenda Cincinnati summit to look at and develop solutions for challenges facing the African-American community. The day-long summit will be held June 11 at Woodward High School. Joining us to discuss the Black Agenda Cincinnati summit are Word of Deliverance Ministries for the World Senior Pastor and President of the Greater Cincinnati Chapter of the National Action Network, Bishop Bobby Hilton; and Center for Closing the Health Gap Founder and President, Dwight Tillery.